DISCLAIMER: Review based on PDF copy provided by Open Design. If you're looking for urban crunch, you've hit paydirt and for this price, you'd be silly not to. 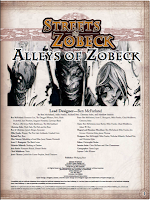 Even if you don't have Streets of Zobeck, there's good content here including feats, locations, monsters, magic, random pickpocket loot and engaging NPCs. And if you do, Alleys is an essential companion with hooks and links between adventures and additional stuff. Maybe the only time urban overspill is a good thing. Contents: Five (count 'em!) rats on a stick. Nothing To Declare gives you a bridge between adventures in Streets of Zobeck and gives you an example of how city folk will take advantage of new arrivals. 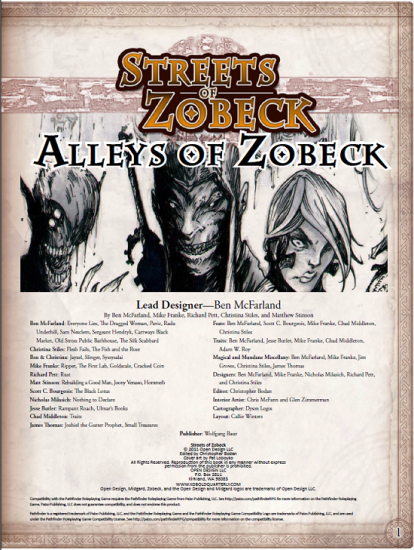 Next is relevant additions for adventure in Streets of Zobeck, from clockwork abominations spawned from The First Lab to a pair of barghests lurking in Scaler's Alley. NPCs follow, ranging from Goldscale (a small but fierce kobold paladin) to Sam Nesclem, ship's captain with a clockwork hand and formidable reputation. Now, the crunch - and how! Feats and traits offer some more versatility, dirty fighting feats will make low-fantasy fans smile while the traits can easily be added to any Midgard game (including an Old Margreve crossover) or adapted elsewhere. Items, magical and mundane await the reader. The appearance of a clockwork hand magic item is a great bonus. Minor treasure charts for opportunist looting follows. Then locations, the Rampant Roach and Ulmar's Rare Books offers two new places for characters to intrigue in. Finally Blackeye's Carriage offers a unique taxi service for the streets of Zobeck. Layout: Four and a half (no refunds!) rats on a stick. I said in my review of Streets that colour would make the difference. Alleys shows how with illustrations of Jaroslav (Nothing to Declare) and Goldscale. Very minor layout slips and no cover (not critical for a PDF) shows focus on content, content and more content. Dyson Logos on cartography providing some classic old school styling which is easy to read and use in-game. Web supplements are usually simple affairs, a few extra NPCs and a couple of bits of crunch and fluff to round them out. Some material has been showcased on the Kobold Quarterly blog. In amount and quality the content is beyond the typical web supplement and overflow product. At the price this is a steal and it's redolent of Zobeck's steampunk stylings. Get this before they change their minds about the price!